Now say it three more times, but slower. Anyway, where were we. Ah, right... dinghies. 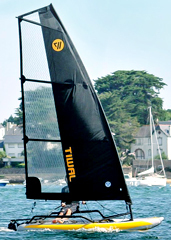 Boat shoe up for Tiwal, the world’s first high-performance, inflatable sailing dinghy that also happens to fit in the trunk of your car, now available. It’s a compact vessel made of PVC material that’s just over 10 feet long and has a boomless sail. Booms are stupid anyway. Neat. How does it work? Pump it up, install the PVC centerboard for stability, toss up the aluminum poles, attach the sail and there you go: inflatable summer. Do you agree that dinghy’s a funny word? We do. We really actually do. So once I have it set up, I can just go sail in the ocean? Yeah. It’s made to hold up in rough waters. Yeah, and the whole thing fits in two bags so you can throw them in your trunk or on the deck of your other dinghy. I don’t have another dinghy. Great. You’ll appreciate this one that much more.